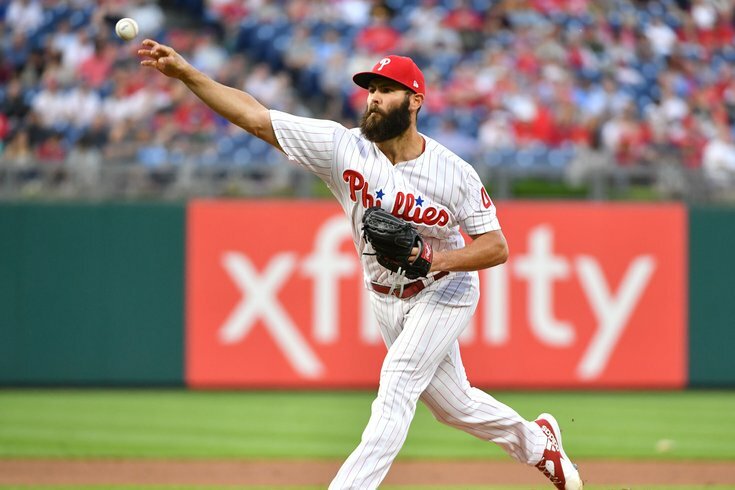 Jake Arrieta's Phillies have been one of the biggest surprises so far this season. It refers to a fighter who has lost his legs, can’t take a punch, can’t get out of the way of a punch and one whose reflexes are “shot” from being in too many wars. They can’t go into the late rounds anymore, entering a stage of their once-great careers where they are taking too much punishment. Presently, Jake Arrieta looks like a “shot fighter,” in comparison to what he used to be. Owner of a three-year contract worth $75 million, which includes $30-million this season, the 32-year-old Arrieta hardly looks like the pitcher the Phillies thought that they were getting. He is 2-5 in his last 10 starts. He was once a strikeout machine. Now, the only imposing qualities he seems to have are his beady, unmoving scary doll’s eyes that used to melt hitters. He’s had two games in which he has had 10 strikeouts or more over the last two years, while in 2016, he had four 10K-plus games alone. Signs that there was some slippage in Arrieta may have come from his former team, the Chicago Cubs, who hardly made a phone call to re-sign him after Arrieta helped the Cubs to the 2016 World Series in four-and-a-half excellent seasons, after garnering the 2015 National League Cy Young Award when he went 22-6 with a 1.77 ERA over a career-high 229 innings and 236 strikeouts (which included five games in which he struck out 10 batters or more). In April, Arrieta looked like the “vintage Arrieta of Chicago,” striking out 10 in a 7-0 win over Pittsburgh on April 19, and going 3-1 in five starts. In June, he’s gone 0-4, with a 6.66 ERA over 25.2 innings after the New York Yankees smacked him around for six runs (three weren’t really his fault) on a season-high nine hits in a 6-0 loss on Tuesday night. Over the first three months of the season, he’s 5-6, with a 3.54 ERA and 59 strikeouts in 84 innings. Through the first three months of 2017, Arrieta had 93 strikeouts, a 7-6 record and a 4.67 ERA, so his ERA this season is lower after the initial three months. Though, something seems to be missing. Since going 18-8 with 190 strikeouts in 2016, he’s been 19-16 the last two years, with 222 strikeouts. Arrieta hasn’t exactly received great defense behind him. Against the Yankees, the Phillies porous defense bumbled again, when second baseman Cesar Hernandez botched what could have been an inning-ending double play in the third, which led to three runs. He’s given up 27 runs in June—19 were earned. “You can make excuses,” said Arrieta, who’s been very accountable, after the game on Tuesday. “It doesn't change the fact you have still go out there, get guys out, minimize damage and get past it. I had an opportunity, even after the error, to get out of it. It’s been over two months since Arrieta struck out 10 batters in a game. Prior to that, it had been over a year since he did it last. His fastball isn’t what it used to be. Arrieta is still a fighter. He’s responsible. He’s filled with character and will power. He did have a good May, where he went 2-1, with a 0.90 ERA. Maybe June was an aberration. Maybe it wasn’t. The symptoms of a shot fighter are when they’re unable to get a rhythm going, when they’re unable to get out of the way of a punch—and when they get hit too often, and hit hard—like Arrieta’s been this June. PHILLERS: On Tuesday, Phils’ reliever Pat Neshek made another rehab appearance, this time in Reading. The right-handed submariner threw 16 pitches, 10 were strikes, over one inning, giving up two hits and a run. It was the second rehab stint for Neshek, who went a scoreless inning in Clearwater on Saturday. In December, Neshek re-signed with the Phillies to a two-year deal, then was placed on the disabled list in March with a shoulder strain and suffered another setback with an elbow injury in May.